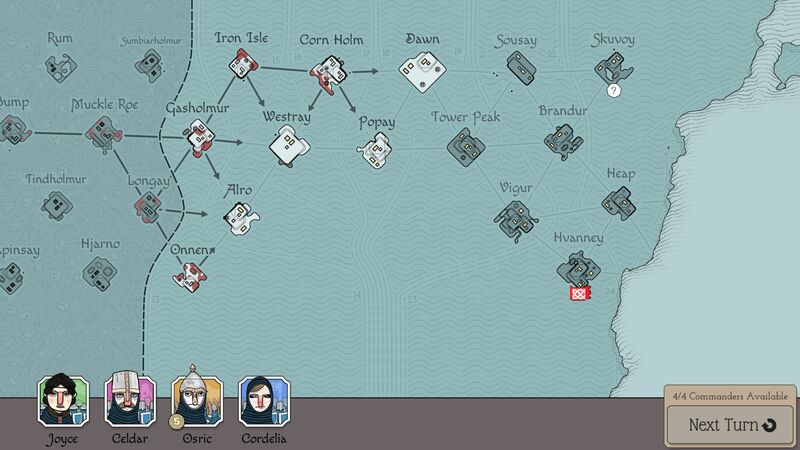 Bad North is the first game for a long while that has stirred in me a terrible desire to have it in physical toy form. I would, I think, love nothing more right now than to have a tiny island on my desk, with tiny squads of soldiers and tiny corpses of my enemies on the shore, near where they had beached their tiny boats. As you marshal your troops around each randomly generated, adorable little wind blasted island, they make teeny soldierly noises: hup hup hup! hup! Their little boots patter across the ground. They would be terrible choking hazards to a man, but that’s fine because I would die for these small bois. The islands could have that weird sawdusty grass that Warhammer figures have on their bases. It’d be great. War is hell. Your miniature army has a kind of harrowing backstory, though. 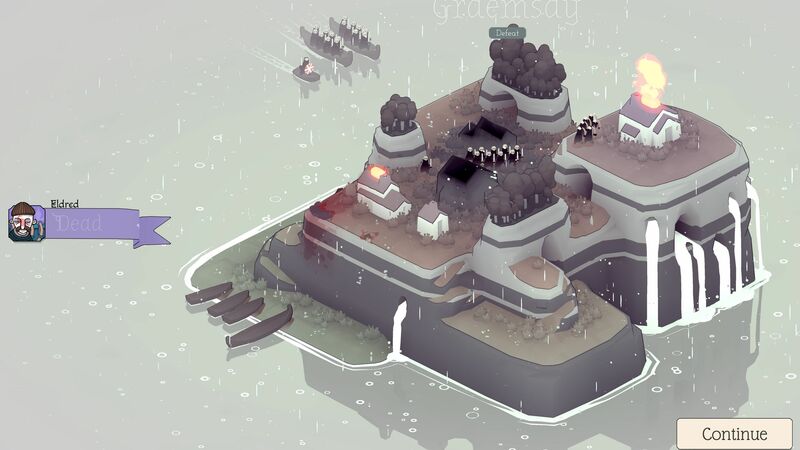 You’re fleeing a constantly oncoming horde of viking invaders, keeping one step ahead of them by daisy chaining across little procedurally generated islands. On each island you must survive a few waves of these marauders — and, if you can, protect any homesteads too, as they’ll provide you with loot to buy upgrades for your army. Each of the little squads has a different bannerman, and with enough money you can upgrade them from militia to specialists (sword and board infantry; archers; defensive pikes), to veterans of their class, and unlock special abilities to go with it. Soon, you’ll find what kind of units you prefer. My first run at the game I got about 60% of the way through by playing reactively with defensive troops, trying to move around pikemen instead of planting them in good positions to block enemy advancement. Viking heavies slipped through and decimated most of my army, leaving only a measly reserve archery unit to make a famous last stand on a bleak, hilly island whose trees all had black leaves. My second attempt went much better, as I split my troops between high level infantry and archers. Leaving the archers on high ground gave covering fire, and with a good vantage point and fair weather they could take out entire boats of vikings before they even touched the beach. The infantry can make a decent enough shield wall, but move faster than the pikes, so could flit to different sides of the island as needed. You soon figure out other tactics, too: target the islands with the most buildings to maximise your rewards per battle; sniff out islands with mystery items denoted by a question mark, giving your warriors even more abilities; give the war horn item to a frontline troop because they’ll need the ability to summon extra troops. You can spend time layering up your other tactics because the controls themselves are so alarmingly simple. They boil down to clicking to send your troops to different areas, because the AI then handles how they behave once they get there. The skill is in figuring out what that’ll be when you combine it with the enemy AI. If that ship is landing on that shore, which way are the lads inside it going to run first? When you get it right you feel like a genius war general. Each battle is small and short and self-contained, so Bad North has all the ingredients to be a moreish barnstormer. The problem is that they combine with mixed results, much like the members of my extended family and homemade sloe gin. 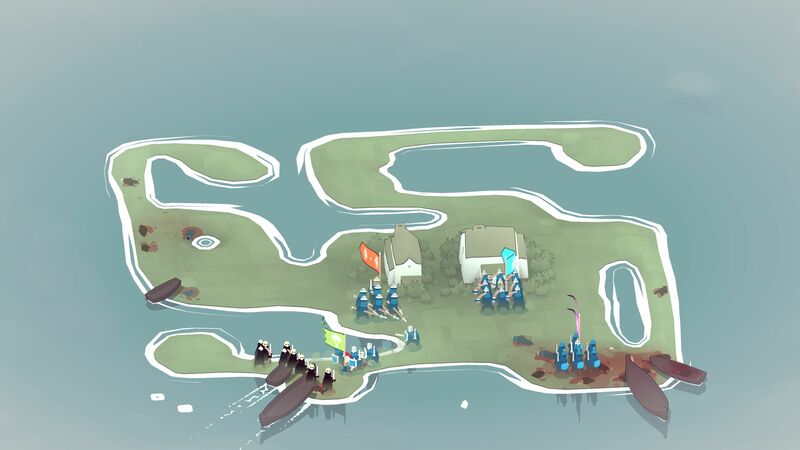 The first two thirds of Bad North can be disarmingly easy, even verging on boring, as the system doesn’t throw up different or weird islands very often early on, and the levels blur into one. This is especially frustrating when you get deeper in and start hitting lovely, twisty islands with isolated coves round the back, or rock pillars and natural arches that hide enemy movements if you’re not paying attention. Different enemy units don’t turn up for a while either, and like an annoying viking version of London buses, will come in huge groups when they do. The game then suddenly flips into being very hard, and it feels a bit unfair to be forced to flee an island because suddenly four waves of berserkers, who can send your small bois flying in every direction, all turned up one after another.